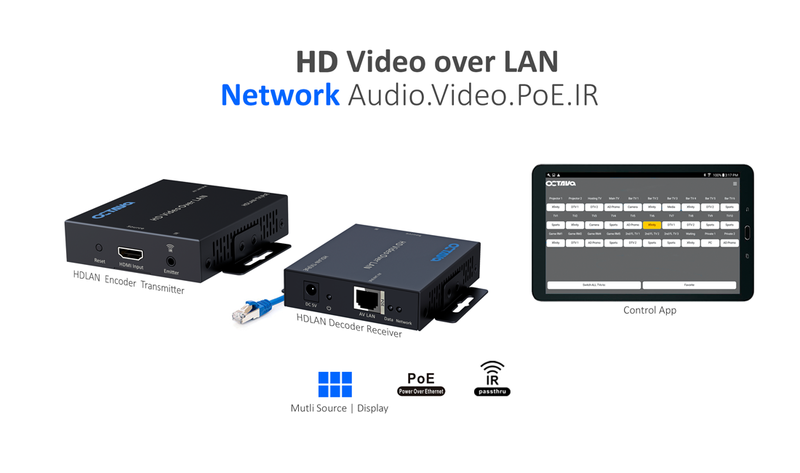 HDMI Over IP - HDLAN | PoE - Video Over IP and HDMI Video Connectivity Solutions. 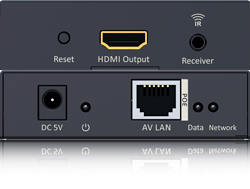 The Octava HDLAN | Poe distributes audio , HDMI video and IR over standard Ethernet Network. 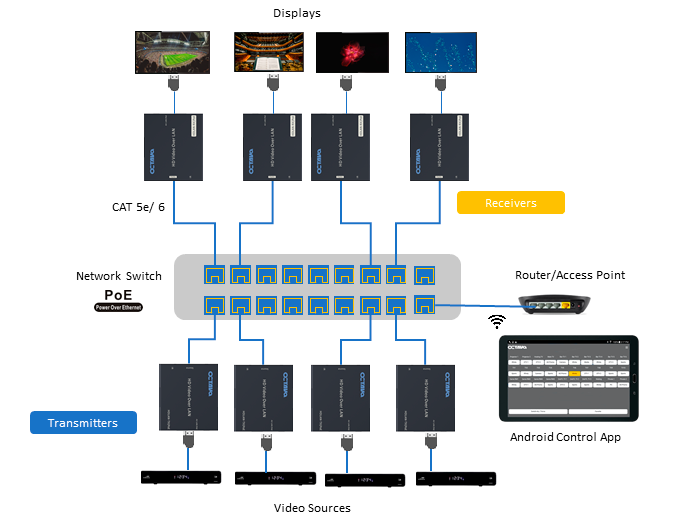 Create virtually any size multi source to multi display video display system. 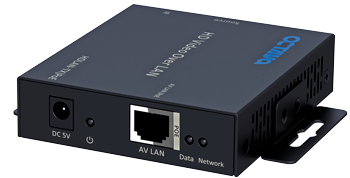 The Octava HDLAN | PoE HD over LAN /IP is an easy to use, scalable HD video switching solution enabling the design of multi-source to multi-video display systems using standard ethernet cables. The HDLAN | PoE HD simplifies installation of HD Video system by using available CAT 5e/6 cable and a Gigabit Ethernet LAN switch. The HDLAN | PoE utilizes advanced MJPEG techniques and IP protocol to deliver 1080p video 300ft+ feet. Transmitter and Receiver units are PoE compatible and can be directly powered from PoE Network Switch. External power plugs are not required, allowing for clean and compact installations. 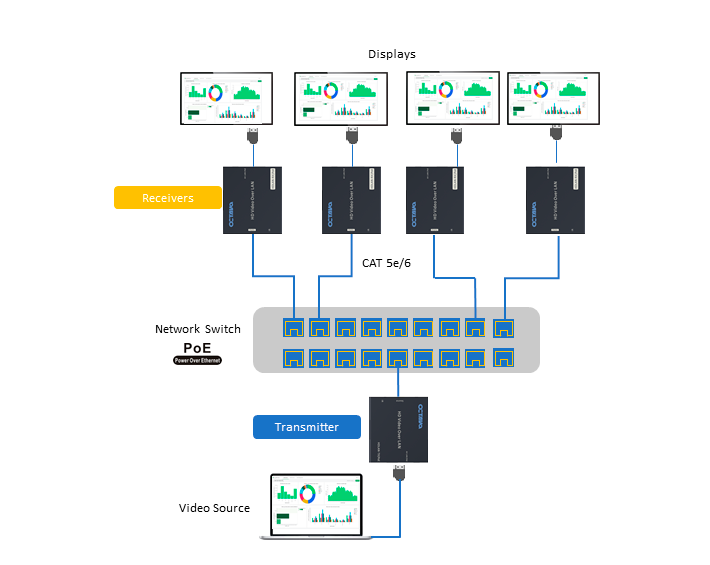 The HDLAN | PoE system is based on a scalable architecture thus enables system designers the flexibility of adding video sources or displays to the system as needed with minimum effort. A customizable Control App for tablets simplifies system controls. Ideal for digital signage, house of worship, education, enterprise applications requiring multiple displays over longer distances using existing LAN infrastructure. Scalable Architecture- Easily Add Sources or Screens as Needed. Ideal for Large Scale Video Switching Applications Up to 255 Screens. Powered from PoE Network Switch. Just plug in network cables. 300 ft Link Distance over CATx Cables. Longer Distances Achievable. HDLAN | PoE HDMI over IP Transmitter Unit. Distribute Audio, Video, IR. PoE Powered. 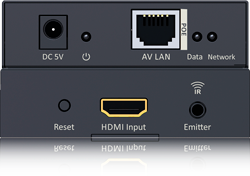 HDLAN | PoE HDMI over IP Receiver Unit. Distribute Audio, Video, IR. PoE Powered. HDLAN | PoE - Multi Source to Displays Video Distribution. Ideal for enterprise, education, hospitality venues requiring matrix routing of video sources and displays. PoE Powered Conforming to IEEE 802.3af or 802.3at. Local Power Option from 5 VDC Available. Let us know about your system. We will happily provide quotation for review. There is no-obligations for purchase.